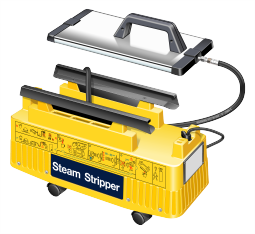 The HTW Steam Wallpaper Stripper designed for the tool rental and professional decorating markets, is the most productive, safest and easiest to use steam wallpaper stripper. The HTW produces steam at just the right pressure and temperature for fast effective stripping with the minimum of condensation. This critical design feature reduces the risk of over-wetting wallboard or the plaster surface of the wall being stripped, and keeps the working environment comfortable. A unique, two-stage anti-scald system prevents the sudden escape of hot steam and water should the user tamper with the steam cap when the steamer is in use. Simply fill with hot or cold tap water and connect to the power supply. The HTW-5 will steam-up in 10 to 25 minutes and continue to run for up to an hour and a half before switching off automatically when a low water level is reached. The user then simply disconnects the HTW from the power supply, waits 2 minutes to allow the steamer to cool, and then refills. This eliminates the need for the user to remember to constantly check the water level and removes the need for troublesome switches, buzzers or sight glasses. Even if the HTW is left connected to the power supply with a low water level it will safely switch on and off as the heating element cools down and heats up. The hot steam tank, made from marine grade alloy that will not rust, is fully shielded from the user while four castors provide excellent mobility. 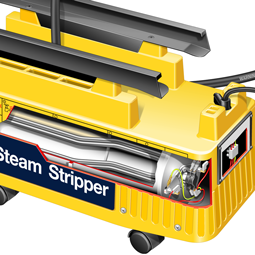 These features make the HTW easy to move around the work site without the risk of picking up the steam stripper when it is in operation or when the tank is still hot after use. 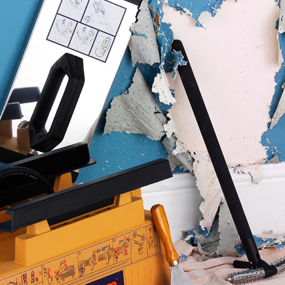 Completely self contained with no loose parts, the HTW will remove vinyl, foil, flock, woodchip and multi-layered papers, including painted-over wallpaper, with ease. The HTW is even effective on non-paper based wall coverings such as hessian fixed with UPVA glues. Simply plug and strip with thermal cut-out. 4 castors for easy mobility.